OUR NEW BROCHURE IS HERE GET IT NOW! Jennifer's Skin Removed after Massive Weight Loss! Kandis's Breast Augmentation, Facelift, Tummy Tuck and Liposuction! Destination Beauty is here to help you arrange your plastic surgery Thailand holiday. You start by requesting for our brochure. Start reading more about our prices and different procedures. We offer breast augmentation, tummy tuck, liposuction, facelift or perhaps a breast lift. We can do all normal plastic surgery procedures, see our plastic surgery thailand price list for the full list. To get your own personal quote you should fill in our evaluation form. Simply open our evaluation form to get started (remember to attach pictures). Our plastic surgeons are all board certified plastic surgeons. They are very experienced. Our most experienced plastic surgeons have carried out more than 10,000 surgeries. You may have heard about Dr. Narongdej (Dr. NJ), Dr. Kasemsak, Dr. Angkana, Dr. Dalip or Dr. Rungkit. Dr. Narongdej is our head surgeon at Destination Beauty Plastic Surgery Center. We only work with accredited and high standard international hospitals in Thailand. You will have a single room with your own toilet/shower, room service menu, satellite TV and Internet. The surgery is carried out to the highest safety standards. For all plastic surgeries (except minor procedures) you will be admitted into the hospital and recover in the ward for minimum 1 night. In the ward our specialist doctors and the nurses will help you manage your pain. We have been helping people like yourself since 2006. In that period more than 20,000 people had surgery with us. When we ask our clients “why Destination Beauty?” they typically say: “My friend recommended me”, “You were easy to find and easy to deal with” or “Your prices are affordable”. Jennifer’s story and results are most impressive. CLICK HERE TO SEE JENNIFER’S AFTER MASSIVE WEIGHT LOSS! Brooke, mother of 6 from Australia has completed her 50 kgs weight loss journey and came over to have skin removal surgery in Bangkok. CLICK HERE TO SEE THE BEFORE AFTERS AND READ HER STORY. Joanna’s Breast Reduction, Tummy Tuck, Arm lift, and Thigh Lift in Thailand! Joanna had weight loss surgery and traveled to Bangkok to have her breast, tummy, arm and thighs surgery done! CLICK TO SEE HER BEFORE AND AFTER PICTURES AND VIDEOS HERE! Sharlene, had gastric sleeve surgery in Bangkok and she managed to lose 18 kgs within 15 days after the surgery! CLICK HERE TO READ MORE ABOUT HER WEIGHT LOSS SURGERY!! 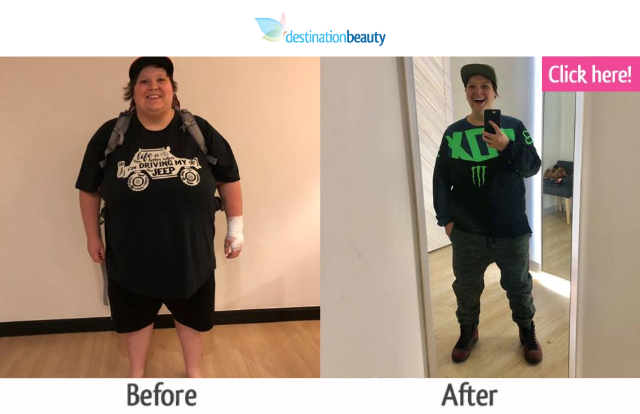 Nicole lost a massive amount of weight and as the result she ended up with a lot of loose and excess skin especially on her breast and tummy. CLICK HERE TO READ MORE ABOUT NICOLE!! CLICK HERE TO GET FREE SURGEON EVALUATION FOR PLASTIC SURGERY IN THAILAND! Weight Loss Surgery Thailand Stories! Read more stories of our clients who had gastric sleeve surgery in Thailand! CLICK HERE!